WASHINGTON: Expressing concern over violence in occupied Kashmir, the US on Tuesday urged all sides to make efforts towards finding a peaceful resolution. “Obviously, we’re concerned about the violence. 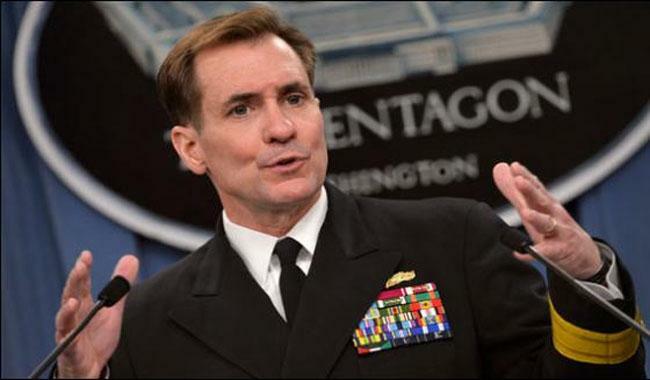 We encourage all sides to make efforts towards finding a peaceful resolution,” State Department spokesman John Kirby said at a press briefing. Indian forces have killed over 30 protesters after the extra judicial killing of Burhan Wani, a commander of Hizbul Mujahideen. When asked to comment on Zalmay Khalilzad’s claim in his book that Durand Line is a disputed territory between Pakistan and Afghanistan, Kirby said US was not focused on lines on the map. He said Washington was focused on lines of effort by both governments to go after terrorists groups in the border region between Pakistan and Afghanistan, which he said was still a safe haven for many terrorist groups. “We understand that effort also has not always gone smoothly, and we continue to urge those two governments to work together along that spine to eliminate the safe haven that so many groups there still enjoy,” he said. The spokesman said that the terrorists groups were targeting both Afghan and Pakistani civilians. “So there’s a shared interest there, and that’s what we’re focused on”.